生徒作品NO.1205☆オリジナルコース　絣柄でギャザースリーブのブラウス　☆　Gethered sleeve top which used Japanese ancient fabric. Foreign students like Japanese fabrics. 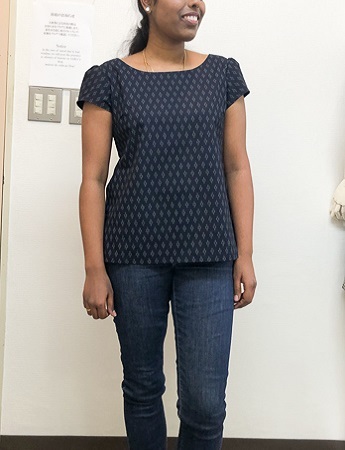 The fabric chosen by this student is a kasuri pattern. Kasuri is originally a technique that was transmitted from her home country, India to Japan.This is a printed fabric, traditional fabrics of ancient are weave patterns. This is her 2nd work on the original course after finishing our basic course. The technique is a bit more complicated than the previous work. Size perfectly finished, lovely ♡ It became a good for summer.